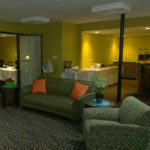 Pacific Inn has a variety of services and amenities available to our guests. Our Front Desk is open 24 hours, in order to assist guests with reservations and travel information. Located in the Pacific Inn lobby, The Olive offers fresh ingredients and home-made fried chicken. Excellent food and service are only steps away from the comfort of your guest room! Located within the hotel the Orca Room offers conference services available that can accommodate up to 30 people. Ideal for small meetings, baby showers, birthday celebrations or any other small gatherings.